So, how do you bake a cake with no sides? MFG Pan Extenders makes every piece a center cut. When used with standard baking sheets, MFG Tray pan extenders result in straight sides and edges on baked goods so that every piece has the appearance of a center cut. 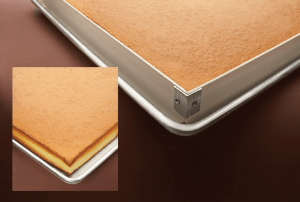 Pan extenders ensure that baked products are even in height, color and texture across the entire surface, insulating the edges of the product to prevent over-baking and eliminating losses due to trimming. Pan extenders are great for baking sheet cakes, brownies, corn bread, sweet rolls and others. MFG Tray pan extenders are made of oven-safe, temperature-resistant composites and offer better insulation than aluminum or stainless. They are available in a wide variety of sizes to fit any cooking sheet or pan, and a variety of configurations to accommodate different sized portions. Custom configurations are also available. Contact Linda Noles for more information at 814 683-4500 or lnoles@mfgtray.com.